How an electrified, 660-pound behemoth became a common diagnostic tool: the ECG. Before 1906 no one understood what atrial fibrillation (abnormal heart rhythm) was, so Dutch physician Willem Einthoven’s article “La Télécardiogramme” was startling in its revelation that different forms of heart disease, including fibrillation, became apparent in a readout that could be used diagnostically. But as Einthoven admitted, getting readouts was “expensive and complicated”: His electrocardiograph machine weighed 660 pounds and required five trained operators. Despite such deterrents, not two decades later, in 1924, Einthoven was awarded the Nobel Prize in Physiology or Medicine for his development of the diagnostic applications of the electrocardiogram, or ECG. To record the heart’s electrical activity, he had determined that a patient must immerse his arms and his left leg (creating a triangle, each side offering information about the voltage generated by the beating of the heart) in tubs of saline solution. Wires in the tubs picked up the heart’s electrical signals, which were then transmitted over telephone wires from Leiden University Hospital to Einthoven’s machine in a laboratory a mile away. 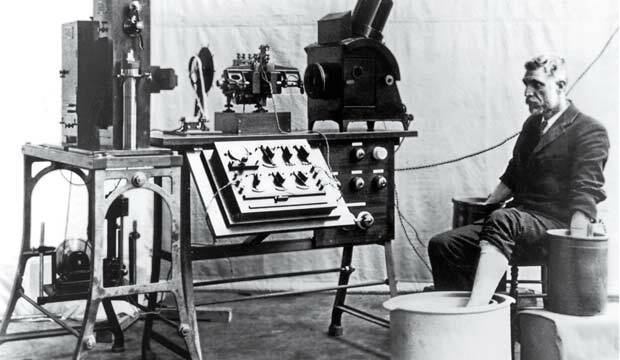 Einthoven thought differently, and he began to work with the more sensitive string galvanometer: a fine silver-plated quartz wire stretched between powerful electromagnets perpendicular to an optical projection system. As the heart’s minute electrical current moved the string, the string obstructed a beam of light, and photographic paper recorded the resultant peaks and valleys. After World War I, technical advances made the ECG accessible to more hospitals. The Cambridge Scientific Instrument Company produced a 50-pound model, and by 1935 the Sanborn Company had halved its weight. Today’s bedside ECG machines are a far cry from their bulky progenitors. And thanks to the introduction of electrodes sensitive enough to detect the heart’s impulses through the skin, no tubs of salt water are necessary.